How lovely, especially that blue, blue water. Thanks for sharing your visit with us. You could work for the Florida tourist bureau - everytime I read about your beautiful state - I want to check my travel account to see when I can get down there! LOVE this post. This is my kind of Florida and my kind of flora and fauna. 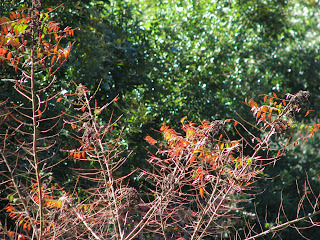 We have cypress trees that border the pond and sweetgum trees in the backyard that are deciduous - with yellow and red leaves. It isn't the glorious color of a northern fall, but delights me none-the-less. 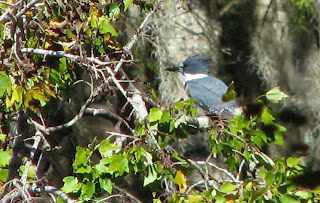 I snagged a couple of blurry belted kingfisher photos one day last week when I discovered (or rather heard) her (with her added rusty plummage) eyeing the pond from one of the cypress trees. I didn't post them, but maybe I should. Very difficult to photograph. As I inched closer, she moved further and further away, and I don't have the zoom needed for a quality distance photo. I am LOVING this weather, though the morning temps are bit low - and frost is in the forecast for later in the week. The clear skies and cool, fresh air is just about heaven, isn't it? Beautiful photos, Meems. We are so lucky to live in such a beautiful place. Your photos reminded me not to take it for granted. And, YES, the cooler temps feel great but unfortunately we didn't receive any rain in my neck of Florida. Perhaps with the next cool front! At first I wondered if you were kayaking on the river. That's a great walk/path. I'd so love to see a manatee. I did swim with dolphins in Hawaii one time. I should scan in the photo. The water in those springs is amazing! So clear, and you can almost feel how cold it is. It looks like a lovely park. That was fun thanks. Beautiful waters and I love the rocks! Hi Meems, this was a real treat. I love to go sightseeing in different parts of the country. And hearing the narrative from one who loves the land too, is most appreciated. The sky was blue and the water too. No, I did not fall for the diver being you! HA So much beauty in that drive, a part of Florida we have never seen before and may never get to so thanks so much for showing us and pointing out the high spots. I think your bird picture was great! Meems your new header picture looks so warm and inviting. I can picture you all bundled up at the football game. There are so many good teams to folllow in FL. How do you choose which one to cheer for? 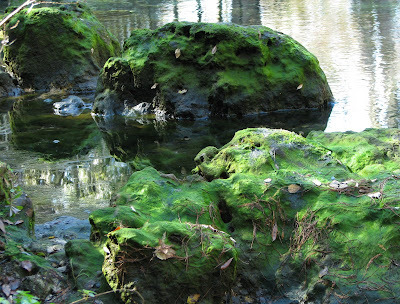 I love all thses pictures of the swamps and the manatee pools. I have never seen one and would love to. 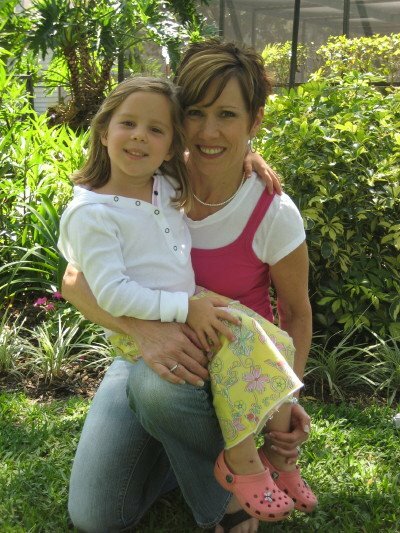 This is the beautiful Florida I have always loved! Often people see the crowded beaches and think that is all it is! It is so much more. My childhood memories are of parks, tall trees and adventure! I just knew from your title that you and hubby had gone on another adventure and we were going to see Florida's crystal blue waters...I had a lovely time...thank you again for sharing these special visits with us! You live in a beautiful state Meems. The northern part is so different from the south. Thanks for taking us along on your little adventure. The clearness of that water just captivated me! just beautiful Meems! I have been fishing in the Everglades National Park and have been to Fairchilds gardens and oh to the keys which reminded me of home. But what I have seen from your photos and very interesting narrative I will make hubby take me whenever we visit Florida again. 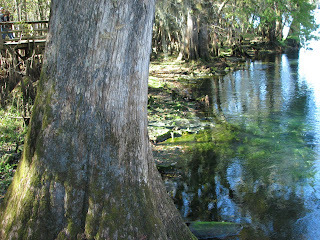 Meems, I have been to Manatee Springs-many years ago. It still looks the same. Lovely and unspoiled. Like you, we didn't get to see a real one, but enjoyed the beauty of nature. Thank you for sharing. Your new header is just beautiful! Pam, It is amazing how spring water can be so clear. Thanks for coming along. It is my kind of Florida, too, Patricia. 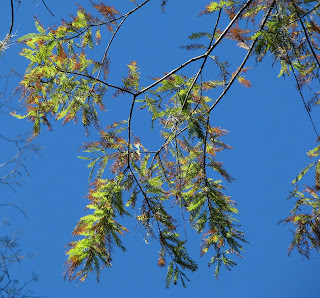 Cypress trees are among my favorites. Oh, I would love to see your kingfisher photos. They are quick and shy aren't they? Your pollywog creek must be a delightful place. And this weather is what I live for all summer. I gardened today without breaking a sweat... it was heavenly. And YOU... diving in caves... how fun!!! I would love to be so adventurous! We didn't get any rain either, Susan. Although on our way up to Tallahassee it rained on us quite a bit and they got several inches... it stopped short of us. This weather is enough to make you find things to do in the garden... never a problem around here. Funny you mention kayaking, Cameron. I am always talking about wanting to learn that with hubby. He isn't too keen on it but there are so many places to go around here it would be fun. 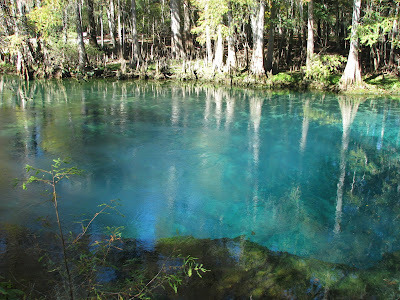 Nancy, The water is amazing and there are lots of springs like this in Florida. They are very cold because of how deep in the earth the water comes from. It is nice to see rocks in Florida, Darla. The green covering them is so natural. We have come to appreciate all the nooks and crannies of Florida, Frances. We are on a quest to see every part of this beautiful state we haven't yet seen. There are so many diverse environments here being surrounded by water on three sides. I just uploaded my Belted Kingfisher photos onto flickr, but I was too far away to get any decent ones. They are quick, shy and loud! You can see them here and here. We were living in G'ville when I took diving lessons - a very long time ago. 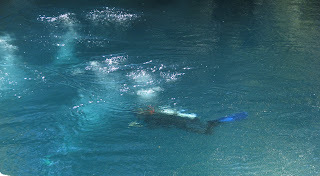 Most of our practice dives were in the springs and caves. It was certainly adventurous and exciting - and now that I am older and wiser, it is not something I'd ever want to do again. So glad to have a fellow lover of all things natural along on our visit to the park, Cheryl. 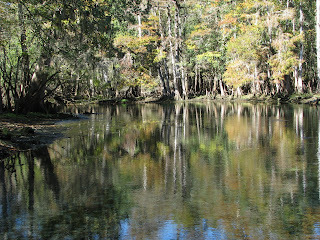 It is so nice to fully take in all the places in our beautiful state that have been left (almost)completely untouched. Fortunately, we are learning to be much more respectful of our environments and how the ecosystems work together to create habitats for all God's creatures. Thanks for coming along. Hi Lisa, It rarely gets that cold and windy at a game but it sure feels like football weather when it does. We don't have a problem picking a team. Hubby's blood runs garnet and gold and always has... a die hard FSU follower. We have season tickets and go to all the home games... We put two of our kids through school there and one son has started a small business in Tallahassee...the bonus is we get to see our son and DIL when we go to the games. Thanks for letting me know you like my new header. It was taken a few days ago while gathering photos for bloom day. 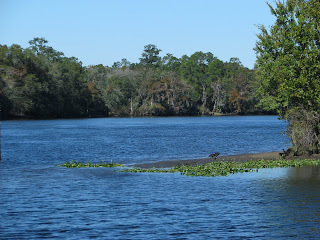 Hi Gail, I see that while we were walking along the river banks and springs you were walking along your gorgeous lake. It was a beautiful day everywhere in the south after that rain cleared out. We never got any of the rain down here but I'm glad everyone else did. Yes, this is the Florida I guess I forget people don't typically visualize. I am a beach lover but also love the woods and any kind of water. Thanks for joining us today. I know what you mean, Racquel, how different the coasts can be. The middle parts of the state are full of beauty as well and lots of rivers and lakes. I took so many pictures of that clear water... you could see right to the bottom in the shallow places. Islandgal, if you ever visit Florida again, I will help you with your tour! 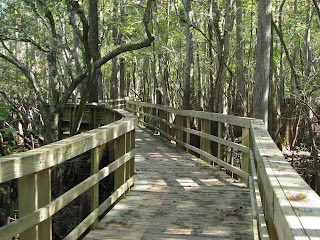 I haven't been to the Everglades in years and never to the keys *gasp*. But there's still time. 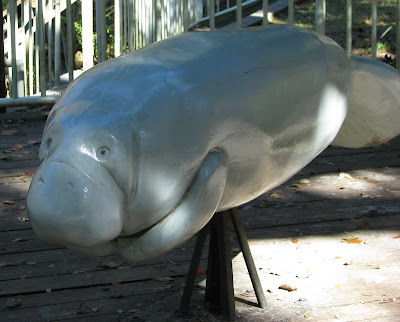 Amy, I guess I didn't get too excited about the manatees because they are in lots of places in and around our coast. I've seen them lots and they are docile creatures even though very large. But I do like to experience all that nature provides so we were on the lookout for them yesterday. Kim, I'm not a fan of bluing in the ponds either... it always looks like something is out of order when that's attempted. Swimming in cold, clear, spring water is a wonderful childhood memory. The true blue water is remarkable to see. Beckie, how very connected I feel to you right now! 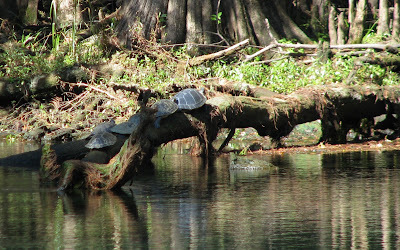 You've been to Manatee Springs! Isn't it nice to know they haven't spoiled it in all these years? I don't know about you, but I've had to get beyond some things (read: years) in my life in order to appreciate some of the more precious natural things in life. 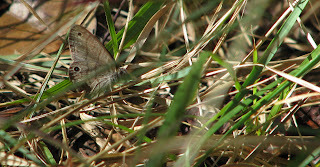 Hubby is even now spotting birds and plants for me to photograph. It's a good place to be at our age. Thanks for mentioning the header too. I love that sound the kingfisher makes, Patricia. It is so distinct so it makes it easy to follow them. Yeah, hubby and I laugh now days about older and wiser... in our case sometimes it means being too careful and missing out on some adventures. We are trying to be sure we find the balance. At least you have the memory of diving to look back on even if you have no desire to do it now. I just think about how it affords a view to a world only to be seen if you get down there with it. Thanks for posting your photos. You must have been about the same distance as me... we'll have to keep trying. Thanks for sharing, meeems! It was a great weekend for all things outdoor (minus the rain on Saturday morning)...which makes me wonder why I spent it all inside! Hmmmmm...oh well, it looks like we might have a repeat this weekend. Maybe I'll take advantage of it then. Your Florida is indeed very beautiful Meems! Your photos show one picturesque scene after another. Thanks for sharing your trip! Thanks for taking us along on your trip Meems. Great photos. I think the pic of the king fisher turned out good. I don't think I have ever seen one of those. They are quite pretty. Hi Meems, What a great post. We've been on that same walk. We also missed the Manatees. We took my ggk there. Young'un & myself. He's the gpa. We try to take them places where they will learn something of nature. I try to teach them of the earth, flowers, veggies & bugs. The oldest grew his own corn when he was 3. I love to watch them when they are learning. Their little minds are like sponges. mjm: We only got a drizzle of rain Saturday a.m. I still dragged the hoses around to give everything a good soaking very early before we left. This November weather has been glorious. I love that we have gotten cool this soon... makes for some very pleasant gardening. Linda, It seems so many folks not familiar with our gorgeous state have one view of it - the beautiful beaches. 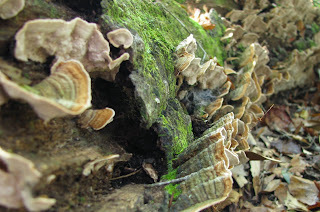 It is full of natural habitat of all kinds. Susie, The excitement over the kingfisher is that it isn't one of those birds that likes to get anywhere near people. 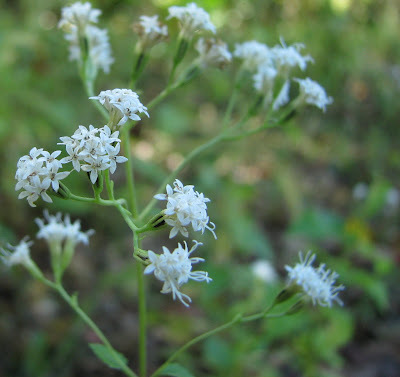 It is so unique, however, that it certainly cannot be mistaken for any other variety. This one was distinctively blue in its plummage when flying. Not as much sitting still. Rose: LOL. I wish I was that brave. Sometimes I think I miss out on some adventures being the careful, analytical type... not much of a risk taker. sigh. Lola: I hear ya on teaching the kiddlings all about nature. Your 3 year old grew corn... that's a wonder! My almost 3 year old grandson LOVES to go out to the garden to pick beans with me and help me water... they pick up on things fast don't they? I do wish people were more thoughtful and aware with what they let the precious sponges soak up... but that's a whole other post. :-) Thanks for your comment. throw a little bit of that warm weather northbound....beautiful pictures.....that water looks so inviting! Talking about the sponges. I laughed so hard when they discovered where the carrots were. That's a story in it's self. I love these experiences with them---something I never dreamed I'd be able to do. The Lord has been very good to me.